British rider Bradley Smith is aiming for a top-six Championship finish after securing his first ever podium finish in MotoGP on Sunday. 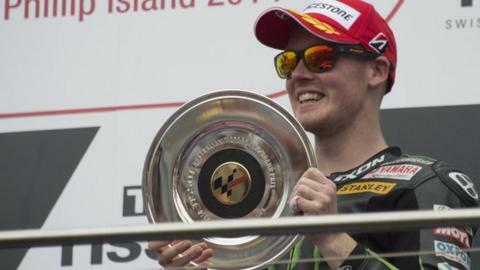 Oxford-born Smith, 23, finished third in Australia after fellow Briton Cal Crutchlow crashed from second place on the final lap, as Valentino Rossi won. "I didn't see that crash, so I didn't know which position I was," said Smith. "I came across the line, saw 'third' or 'Smith' and I thought something was wrong with the screen." Smith continued: "Then I started making some weird noises inside my helmet. It's a special, special moment for me." "It was a strange race. I tried to push at the beginning but was far too aggressive. "I had lots of big moments and nearly crashed three or four times in the opening two laps, so I had to take it down a peg or two." Smith now lies eighth overall in the world standings, with two rounds to go - in Malaysia and Valencia - and has his sights set on improving that position. "We've closed in on the top six in the Championship - that can be our target for the remaining two races," he said.